Following a masterclass presentation on Monday 23 June, twelve independent retailers in the town benefited from a one-to-one advisory visit from The Shop Doctor. 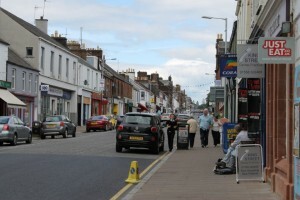 As in other towns already visited across Dumfries & Galloway, each received bespoke advice at the time of the visit and will receive a unique recommendations report highlighting individual opportunities to improve business vitality. Each of the shops receiving a report are able to apply for a £500 grant from Dumfries & Galloway Council towards implementing (some of) the recommendations. In July, The Shop Doctor moves his attention to Wigtown where a similar support programme will be delivered.